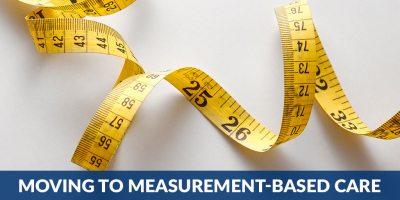 Measurement-based care (MBC) is the practice of gathering patient-reported data via symptom rating scales and using them to inform the treatment process. Rating scales—such as PHQ-9 for depression and GAD-7 for anxiety—allow patients to inform their counselors how they are feeling during treatment. Combined with clinical evaluation, these data can provide a measure of how treatment is progressing or indicate when a patient’s progress has stalled. The Substance Abuse and Mental Health Services Administration (SAMHSA) recognizes MBC as an evidence-based practice. The benefits of MBC extend to patients, providers, and payers. Patients who regularly complete symptom rating scales are more aware of their own progress and feel more engaged in the treatment process. Treatment providers can tailor their treatment program based on real-time data trends. And payers can be assured they are funding treatment whose results can be empirically tracked. Overall, studies have shown that the information gathered in MBC leads to significant improvement in treatment outcomes. 1.The organization uses a standardized tool or instrument to monitor the individual’s progress in achieving his or her care, treatment, or service goals. 2.The organization gathers and analyzes the data generated through standardized monitoring, and the results are used to inform the goals and objectives of the individual’s plan for care, treatment, or services as needed. 3.The organization evaluates the outcomes of care, treatment, or services provided to the population(s) it serves by aggregating and analyzing the data gathered through the standardized monitoring effort. Although previous versions of the standards required organizations to monitor patient progress, the new requirements mandate the use of standardized instruments and the analysis of the collected data. Despite its benefits, the collection and analysis of the data can be an added layer of work on care providers. But companies like Vista Research Group are working to ease that burden. Their web-based tools allow treatment centers to easily record, review, and analyze patient input on standardized symptom rating scales. The three tools that the Vista Research Group provide are tailored to mental health and addiction treatment providers. Patients provide feedback through INSIGHT Addiction and INSIGHT Mental Health. The responses gathered by these tools are then available for therapists to review prior to sessions with patients. INSIGHT also graphs the patient’s responses over time so that treatment providers can see trends or identify signs of impending relapse. INSIGHT can also correlate the data for all patients being treated by a particular caregiver. This provides a snapshot of how patients respond under the care of a given therapist and shows patients whose responses fall outside expected trends, allowing treatment to be modified on a timely basis. In extreme cases, it can also indicate ineffective treatment providers whose methods may need to be reassessed. Vista can also collect data that indicate the long-term effectiveness of treatment. RECOVERY 20/20 follows up with patients at one, six, and twelve months after treatment. These data can be used to identify patients who need to re-enter the treatment program. They also provide a measure of how well the program is serving its patients. The data are compared to national benchmarks so treatment centers can compare their results with similar facilities. This invaluable insight not only allows them to improve programs but also gives them hard data to provide to insurance companies that want to see evidence of effectiveness. MBC has been shown to improve the quality and effectiveness of treatment. The movement toward MBC is crucial in behavioral health care, and treatment centers that want to maintain their Joint Commission accreditation will need to start using and aggregating patient-reported results by January 2018. The additional requirements can be easily met using the data collection and analysis tools provided by Vista Research Group.